Coined as a term by K.W. Jeter in 1987, Steampunk is variously described as retrofurism, technofantasy, and alternate history; at its core, Steampunk is a hybrid genre that makes varying uses of anachronistic technologies, social criticism, DIY and maker culture, and a sense of adventure and play. Proto-Steampunk works such as the novels and stories of Jules Verne, H.G. Wells, and Edgar Allan Poe have influenced the genre, along with scientific romances and the dime novels of 19th. One of the earliest examples of modern Steampunk, which had a greater emphasis on the problematic nature of technology and imperialistic culture, is Michael Moorcock’s Nomads of the Time Streams trilogy. Frequently associated with Victorian culture, Steampunk has in the last decade reached beyond that historical period and been explored in other cultures and time periods. There are more rigid interpretations of Steampunk available but I am not interested in them. Adaptation and reconfiguration are a major component of Steampunk, and definitions of a genre must be fluid if they are to remain relevant. Some examples of Steampunk books include Michael Moorcock’s The Warlord of the Air, William Gibson and Bruce Sterling’s The Difference Engine, Cherie Priest’s Clockwork Century books (such as Boneshaker), Mike Mignola’s Hellboy, Gail Carriger’s Parasol Protectorate Books (such as Soulless), Genevieve Valentine’s Mechanique, Scott Westerfield’s Leviathan series, and Karin Lowachee’s Gaslight Dogs. 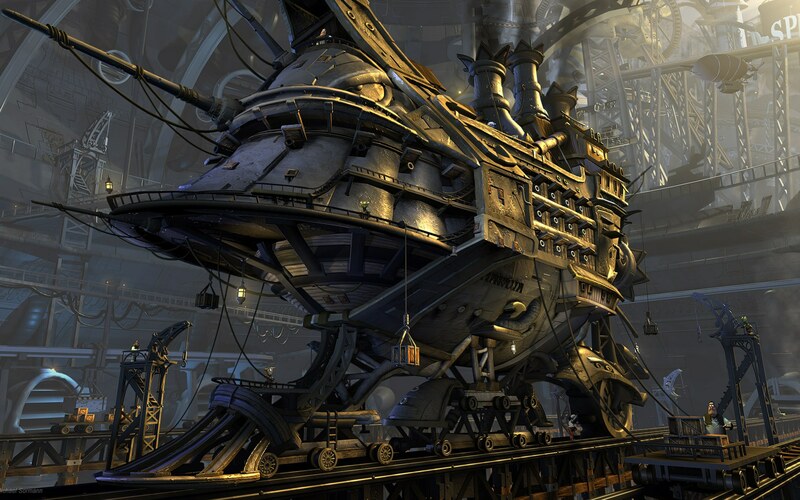 Steampunk’s highly visual component has, unsurprisingly, translated well into movies. Some examples include The Prestige, Howl’s Moving Castle, The League of Extraordinary Gentlemen, Wild Wild West, 9, and Sherlock Holmes. For more basic information on Steampunk, see the wiki, Steampunk Magazine, or Beyond Victoriana. Many great Steampunk stories interrogate and engage with historical and cultural elements in their setting. In particular, we often see the exploration of characters and stories that were ignored by dominant historical narratives. Although alternate history is a large component of Steampunk, be aware of Canadian history and utilize it or rework it in original ways. For example, how would the proliferation of more capable steamships and airships have altered immigration in Canada? How would the western expansion, the Trans-Canada Railway, and the Underground Railroad have been affected by alternate forms of transportation? I am looking for stories that explore diverse settings with all manner of characters: Aboriginals, Francophones, senior citizens, LGBTQIAs, PoC, etc. Length: 2,000 to 8,000 words. Under 5,000 words is preferred. Payment: 5 cents/word for original fiction and a contributor’s copy. Reprints: will be considered if the story has appeared in journals and magazines, but NOT in book form (collections, anthologies, etc.). Payment for reprints is 2 cents per word. Indicate where the story was first published and when in the cover letter. Reprint stories must also be set in Canada. No poetry, plays, or novel excerpts. Only short fiction will be considered. No simultaneous submissions. The only exception is for stories submitted for the $15,000 Vanderbilt / Exile Short Story Competition sponsored by Exile Quarterly / Exile Editions (seehttp://www.theexilewriters.com/poetry-and-fiction-competitions/). No multiple submissions. If you received a rejection before the deadline you may submit again. Submit stories in standard manuscript format as .doc, .docx., or RTF with indented paragraphs, italics in italics and bold in bold. Include full contact information and word count on the first page. Include a cover letter (name, story title and word count, contact information, previous publications) in the body of the email. Include a brief biography and indicate if you are an Aboriginal writer, culturally diverse writer, Francophone writer, or new generation writer. Submissions in English only, although stories translated into English are acceptable. Reading period: December 1, 2014 to April 30, 2015. Do not submit stories before this date. All acceptances or rejections will be sent before June 31. Please do not query before this date. The book will be published in Spring 2016. Canadian: Canadian permanent residents, Canadian citizens, Canadians living abroad. Canadians living abroad must indicate their status in their cover letter. Aboriginal: Means status, non-status, Métis and Inuit people. Francophone: Someone whose mother tongue is French and still speaks it. New generation: Between the ages of 18 and 30.